After having improvised music for six years, Alexia Sloane, born in 2000, began taking formal composition lessons at the age of 12. Since then, she has been a composer with Aldeburgh Young Musicians, The National Youth Orchestra and the Britten Sinfonia Academy as well as a First Study Composer at the Royal College of Music Junior Department. She is fortunate enough to have been selected as the winner of The Cambridge Young Composer of the Year, the Joan Weller Composition Prize, The Humphrey Searle Composition Award, the Royal Philharmonic Society/Classic FM 25th Birthday commissions and the BBC Proms Inspire Young Composers’ Competition. Her work has been performed by The Aurora Orchestra, The Ligeti Quartet, The Brodsky String Quartet, The Hermes Experiment, The Phaedra Ensemble, Dr K Sextet, St Catharine’s Girls Choir, Kings Junior Voices and Ensemble 10/10, among others. She has also written for soloists such as Huw Watkins and Oliver Coates. Over the years, Alexia has been generously supported by the Amber Trust, The Humphrey Searle Foundation and more recently by a Gough Kelly Award at the RNCM. 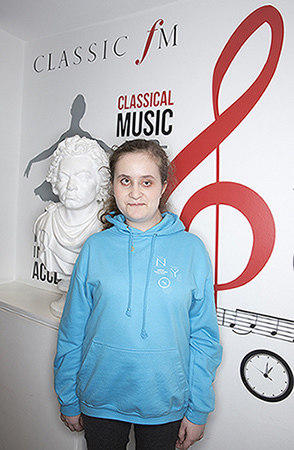 Now in her second year of her undergraduate studies at the Royal Northern College of Music, studying with Professor Emily Howard, Alexia hopes to become a professional composer and writer. Her poetry is often metrically free with a strong focus on imagery and sonority. She is deeply concerned by the environmental, social and political issues that exist in contemporary times, and both her musical and literary work often reacts to one or more of these. As a Buddhist, Alexia feels that it is essential for activism to be creative and compassionate, and hopes to develop her art with this in mind. Future projects include a BBC Commission following the Inspire Young Composers’ Competition and a song cycle for alto, counter tenor, non male choir and ensemble. Most if not all of the libretto will consist of her current anthology in progress, ‘ bird’s eye views ‘ which she hopes to complete by the beginning of her third year at the Royal Northern College of Music.